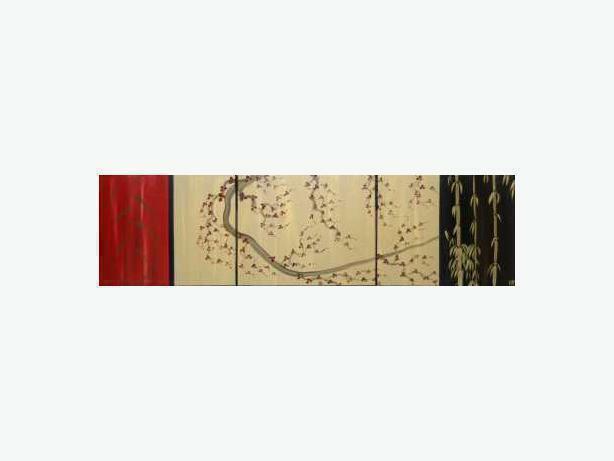  Log In needed $175 · Beautiful Cherry Blossom and Bamboo Painting Original Art! Original Abstract Acrylic Painting. "Blossoms and Bamboo"
60" by 16" over three stretched canvases, 1" deep. SHIPPING IS FREE to anywhere in Canada. I'm based in Arnprior, Ontario and also deliver to Ottawa every two weeks for only $5 (no matter how many paintings are purchased).